George V, known as the ‘Philatelist King’, came to the throne one hundred years ago, and to mark the centenary, the British Postal Museum and Archive (BPMA) is staging a major exhibition at the City of London’s Guildhall Gallery called Empire Mail: George V and the GPO. It is part of London 2010:Festival of Stamps, a year-long programme of events designed to highlight the importance of stamps, stamp design and postal history. There is a pleasing symmetry to the date – 6 May 1910 – of George becoming king as it was 70 years to the day in 1840 that the Penny Black, the world’s first stamp, came into use. It was almost as if the King was destined to be a stamp collector and he took a lifelong interest in the subject. At the time of his death in 1936, he had amassed 328 albums containing almost a quarter of a million stamps of the British Empire, the greatest collection of its kind. The Guildhall Gallery exhibition includes some of the stamps from the Royal Philatelic Collection which George himself would have bought. But as the Collection’s Keeper, Michael Sefi reveals, he was not the first royal with an interest in philately. Normally, researchers would have to make an appointment to see stamps from the Collection at St James’s Palace, but this show gives the public the chance to see some of the rarest and most valuable stamps in the world. 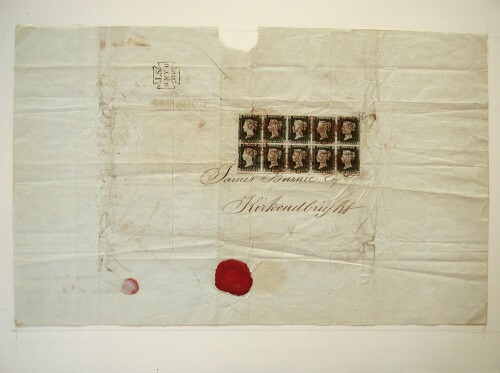 For example, the Kirkcudbright cover, actually a wrapper containing legal documents and posted to that Scottish town on the first day of the Penny Black. Ten of the stamps were used to cover postage and it is the largest multiple first-day use of the stamp in existence. As Michael Sefi explains though, this is a more recent addition to the collection. But although every schoolboy knows of the Penny Black, and millions of the stamps were printed, it had a fairly short existence. People soon realised that the red franking on the stamp could easily be removed and the stamp re-used. So the stamp’s colour itself was changed to red only nine months after its launch and the cancellation altered to black, a more difficult colour to tamper with. Its design also set a trend for the nation’s stamps: it did not include the country’s name, a feature unique to British stamps to this day. Also on display from the collection are examples of the second most famous stamp in the world – the Post Office, or Blue, Mauritius of 1847. They were the first non-British, Empire stamps to be issued and are extremely rare. Five hundred were printed but only 15 penny stamps and 12 two pence stamps survive. In 1993 a cover bearing two of these stamps sold for $3.8 million, the highest known price ever paid for any philatelic item. But the exhibition is not just about stamps. When suffragettes were campaigning for votes for women in the early part of the 20th century, they carried out acts which today would no doubt have them branded as ‘terrorists’. Their anti-postal activities included burning mail in pillar boxes, pouring tar through the posting slot and smashing post office windows. 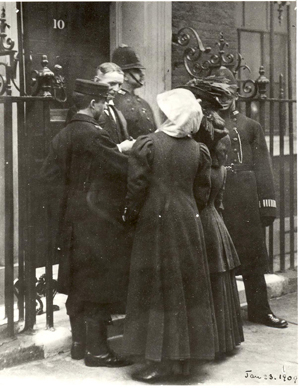 However, one of the best stunts came in 1909 when two suffragettes had themselves ‘posted’ by special messenger as ‘letters’ to the Prime Minister, H. H. Asquith, at 10 Downing Street, to draw attention to their cause. Two years later, the world’s first scheduled air mail service was initiated – actually a trial for only 17 days in September 1911 – between Hendon and Windsor, to commemorate George V’s coronation three months earlier. ‘Aerial’ mail posting boxes were set up in department stores such as Harrods and Selfridges and collected in chartered vans marked ‘Aerial Post Collecting Van’. The pilots, described as ‘aeronauts’, used two types of plane, a Blériot monoplane and a Farman biplane. There were 16 flights from Hendon to Windsor in total which carried 35 bags of mail, each bag weighing over 26 pounds, quite a feat for the flimsy, lightweight machines which were thrown about in high winds and had to fly low to check landmarks for navigation. Altogether, it is estimated that 133,000 envelopes and cards were carried during the trial. There were no other major attempts to utilise airmail in Britain until after World War One and the main means of sending mail abroad continued to be by sea. For example, the official, full name of the Titanic was ‘RMS’, which stood for Royal Mail Ship. Along with the other White Star Line vessels it had a Sea Post Office on board. The Titanic’s was manned by five workers who sorted the mail. When the ship sank on its maiden voyage on 15 April 1912, all five men were lost along with 3,366 bags of mail and 763 parcels. The exhibition also includes sections on the Post Office underground railway, footage from the GPO film unit and the only used example of a stamp known as the two pence Tyrian Plum of 1910, the name given to its colour. Almost 200,000 sheets of the new stamp were printed, 240 to a sheet, bearing the portrait of the then King, Edward VII. Knowing his son’s fondness for all new stamp issues, Frederick Atterbury, controller of stamps at the Inland Revenue, posted an envelope bearing one Tyrian Plum to the Prince of Wales at Marlborough House, his London residence. The letter was franked on 5 May 1910 and the stamp had still not been officially issued. Edward VII died the next day and his son immediately became King George V. The stamps became a casualty of the old king’s death and were never circulated. Orders were given for all sheets to be destroyed, but a few examples ‘escaped’ and are now much-prized by collectors. 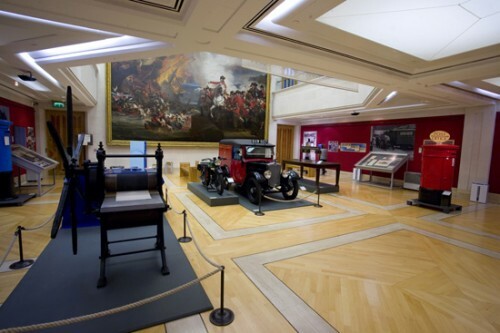 The BPMA itself houses a collection officially designated as being of outstanding national importance and the postal service is a valuable and important element of Britain’s history. Postal heritage, as displayed at the Guildhall Gallery, is actually a tour through a highly important period of the nation’s past during a reign which witnessed a world war, votes (eventually) for women, the General Strike and the British Empire Exhibition of 1924 held at Wembley. If you can’t make it to the gallery before the exhibition closes there is a smaller exhibition at the BPMA itself, also in London, which runs until April 2011. Treasures of the Archive includes a pistol carried by a mail coach guard in the 1800s and a wrapper containing high value bank items stolen during the Great Train Robbery of 1963. It yielded fingerprints which helped convict some of the gang members of the £2.6m robbery (the equivalent of £33m in today’s prices). There is also a section on the stamps that never were, designs made for specific occasions but then never used. One intriguing example shows Scotland as World Cup winners in 1978. The photographs of the Kirkcudbright cover and the Tyrian Plum are reproduced by gracious permission of HM The Queen to whom copyright belongs.